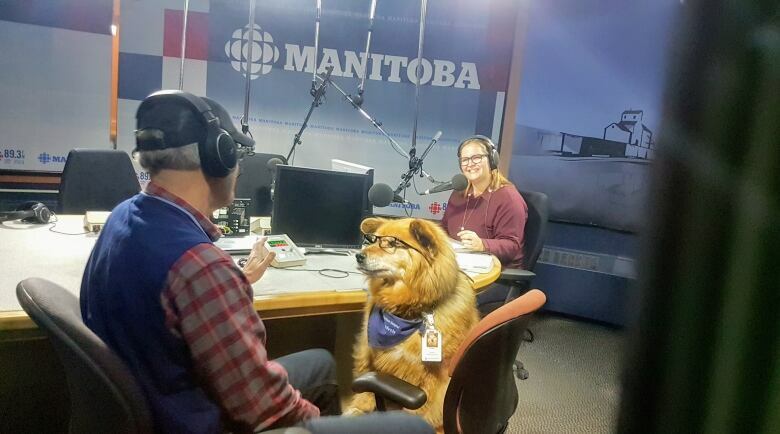 You might already know Rusty: he's nearly 15 years old, he volunteers three days a week at St. Boniface Hospital and — most notably — he's a big fluffy dog wearing glasses. "People ask me why he wears them, and I say because he can and he will," said George Ames, who adopted Rusty from a shelter in Ste. Anne, Man., 13 years ago. The pair have already received a Senate 150th Anniversary Award for their dedication. They're going to be honoured again on Friday, this time by the hospital, with a ceremony recognizing their work. Ames said he's flattered by the honour, but it's the people and conversations he finds at the hospital that keep him coming back. "It is rewarding, and I guess that's what brings us back three afternoons a week there. We get some very positive feedback, and people going into a sterile environment like a hospital are often anxious, and if their health is poor, it's a traumatic time," Ames said. 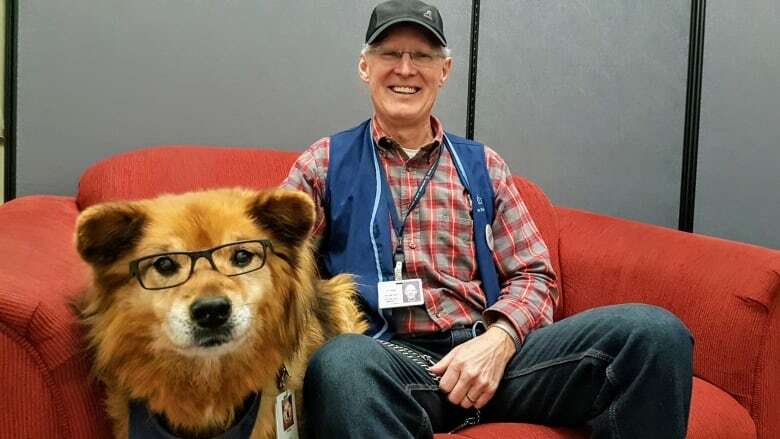 "And a friendly canine face wearing glasses is a huge distraction, and it makes them smile. It makes me smile to see them smile." Ames said he chose St. Boniface because he's got a long history with the hospital. "My son was born there 35 years ago. My daughter and daughter-in-law both have had grandchildren, for me, at that hospital. I've had some surgery there," he said. "I have an emotional history with them." When he and Rusty started with the hospital, they worked with palliative patients, Ames said. The conversations they started were "difficult but very rewarding." "I was very touched by many of the conversations I had with patients like this and it gave me a perspective of life itself," he said. "We see the newborns leave the hospital with their proud and tired parents, and we see the other end of the cycle." Lately, they've been less mobile in the hospital. They spend their days in the Everett Atrium, and that's where the ceremony in their honour will be held Friday, starting at 1:30 p.m. Patients still come down to visit them there, Ames said, and others stop by to tell them how much they helped during difficult times. "I get choked up and Rusty just carries on," Ames said. "It's a gift that Rusty allows me to receive."